In the first two blogs, we covered the benefits as well as the steps for carrying out this impulse control and leadership developing program. If you’ve started or are thinking about starting this program you may have some specific questions. Here are answers to the most common of those questions. For a step-by-step photo-illustrated version of this program, view Perfect Puppy in 7 Days. What if my dog is not “motivated” for his food?He’ll eat it out of his bowl when he feels like it, but he’s not hungry when I want to use food for training. Dogs who get their food for free out of their bowls are often picky about when they eat—although most probably eat more than they need to and are overweight or obese. To get them motivated to eat when you want to use food as the reward, you have to make the resource more valued—limit its availability to build demand. If your dog’s healthy and not interested in eating, then feed him less for a day or two. The rule is that he gets only what he’s willing to work for (vs. giving the rest of the food to him for free!). Pretty soon he’ll realize the free-food tree has dried up and he now has to start working for his keep. Can we have Fido loose in the kitchen with the family when we’re not training him? 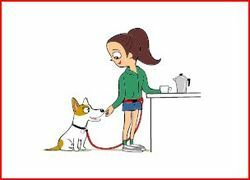 Every time you are with your dog, you are training him even if you’re unaware of how. If he’s free in the kitchen with people milling about, most likely kids or adults will be accidentally rewarding him for impulsive or pushy behavior. For instance, he may rub up against them and they could be completely unaware that they are responding by petting him. Behavior modification is more about training the humans than the dog. The dog can learn new habits in just days to weeks. Human error can drag the modification process out for months. What should I do if he jumps up to surf the coffee table or counter? Since he’s on leash, you can easily pull him off. Do so swiftly (within a split second) so that it’s clear the jumping didn’t work. Then be sure to reward him a lot for sitting on the floor. At some point, the light bulb will turn on—counter surfing doesn’t work to get food, but sitting politely does. What if he is fidgety when I’m working at the computer or my desk and he’s tethered to me or to furniture nearby? He’s very active and tends to pace in the house the entire day anyway. Offer him a toy, even one that’s edible, but that will last. When using edible toys, remember to factor the approximate calorie count into his daily allotment of food. You can also place him in his crate, a separate room, exercise pen, or even a yard as long as he’s not practicing unwanted or anxious, overly aroused behaviors such as barking, lunging, and pacing. Later on, you can work on training him to lie down calmly while you work, since he does need to learn to be calm anyway. An easy way to do this this, which also allows you to get work done at the same time, is to use theMannersMinder remote controlled reward training system. The MannersMinder can also be used to help train your dog to be calm in his crate, when separated in a room, and when outside in the yard. How about exercise? How should I exercise my dog? At this point in the game, when you’re focusing on the indoor exercises and your dog has not yet developed fantastic focus inside, you can take Fido on walks the way you normally do. Later, once you’ve worked on heeling exercises in the house and have good focus, you can focus most of the training outside. Other alternatives to outdoor walks include playing fetch in the yard or treadmill exercise. You may need to teach your dog to play fetch first. Realistically though, while exercise is important, when your dog learns that impulse control and calm behavior gets him what he wants, he won't need to be worn out through exercise to behave calmly and politely.